Maintain the health of the horse’s heart, lungs, digestive system, urinary tract, bones, eyes and skin. *If your horse has a medical emergency always call your veterinarian first, then apply acupressure as time and safety permits. 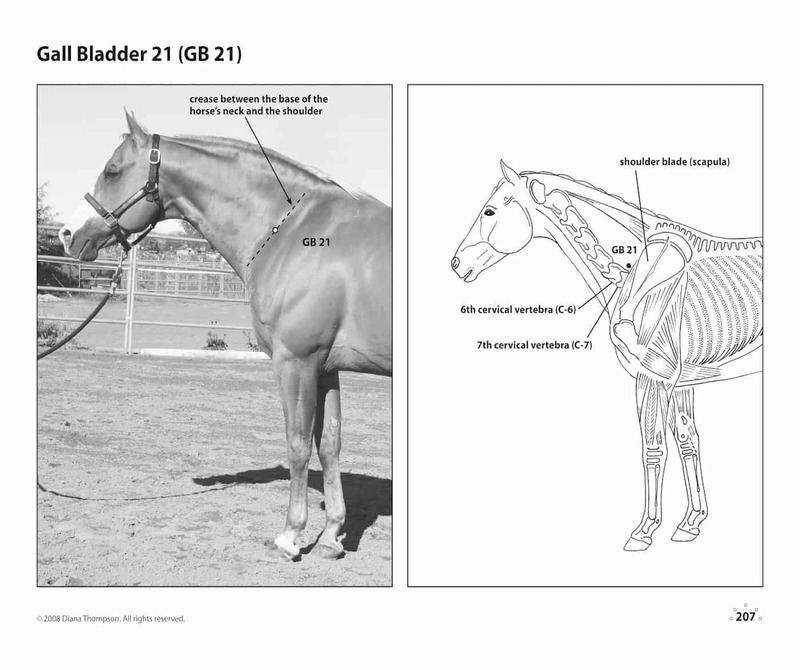 Section Three includes 200 pages of point charts using photos, illustrations and text to detail the locations of 128 equine acupressure points and 14 energy channels (meridians). Section Four provides suggested reading and source materials in equine acupuncture and contact information for holistic veterinarians. 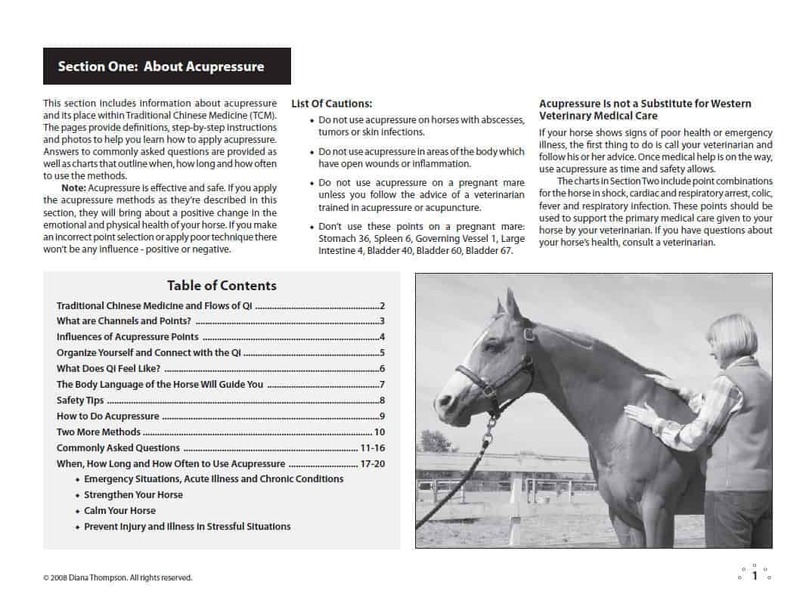 "This book is a much needed resource for horse owners, equine body workers and veterinarians. It is extremely well researched and edited and the photos and illustrations are superb. The descriptive text is precise and written in language that is understandable to both layman and professional." "Diana Thompson’s book Acupressure Point Charts for Horses is fabulous for all horse people who want to learn about keeping their horses vital, flexible and healthy. For veterinarians and other horse professionals interested in Chinese Medicine, acupressure and massage, the book offers some of the best photos I’ve seen for locating meridians and points. For lay people, this book is user friendly, with its layout and practical, precise explanations. Being an educator and author for twenty years, and a holistic veterinarian for thirty, I fully appreciate the work and effort that went into the making of this book. Hats off to you, Diana!" Special Features: The color book cover is a thick sturdy paper stock. The interior pages are 80-pound glossy velvet paper. The book is bound with a semi-concealed wire-o binding. This binding allows the book to lay flat, so you can view two pages at a time, and rotate the pages 360 degrees so you can view one page at a time. The binding also gives the book a spine so you can find it on the book shelf. "Acupressure Point Charts for Horses is fabulous for all horse people who want to learn about keeping their horses vital, flexible, and healthy. 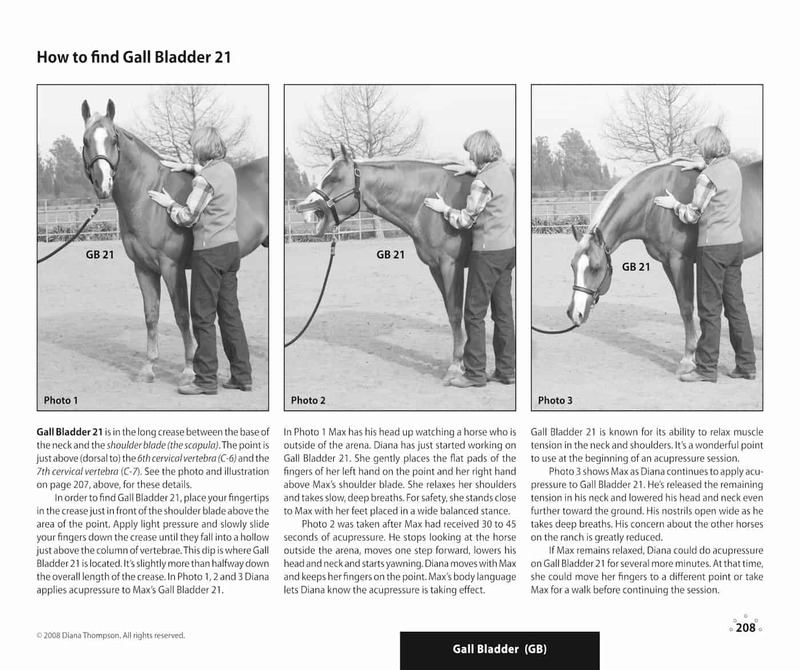 For veterinarians and other horse professionals interested in Chinese Medicine, acupressure, and massage, the book offers some of the best photos I've seen for locating meridians and points. For lay people, this book is user friendly, with its layout and practical, precise explanations. Being an educator and author for twenty years, and a holistic veterinarian for thirty, I fully appreciate the work and effort that went into the making of this book. "Acupressure Point Charts for Horses is a much needed resource for horse owners, equine body workers, and veterinarians. It is extremely well researched and edited and the photos and illustrations are superb. The descriptive text is precise and written in language that is understandable to both layman and professional." "Your book, Acupressure Point Charts for Horses, just arrived this week. I am simply blown away by the overwhelming amount of work that you have done and the incredible quality of everything about the book. This book is just simply outstanding. I am just beginning to explore acupressure, and I can already see that this book will be my guru." Thank you, Diana. You have given the world an amazing gift.